We designed the coolers to create a circular traffic flow around the perimeter wall to expose customers to more products. 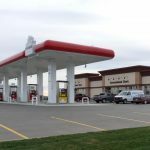 A new 24-hour Shell station had just been built in the community of Hague, Saskatchewan, ideally situated to attract traffic along Highway 11 from Saskatoon to Prince Albert. Having worked on several successful projects for Shell Canada, Mark Walsh & Associates was contracted to complete the interior design of the store following best practices in merchandising. With the walls in place, the new space required a vision. What made this store unique was that it was connected to a larger building housing several other businesses. The design called for indoor access between the spaces. The stores would share joint washrooms, and an after-hours security gate was necessary to block off the other businesses when they closed for the day. A great coffee program is key on a busy highway route. The proposed design with its link to the washrooms and other businesses necessitated some “out of the box” thinking. We turned the challenge into an opportunity, positioning impulse items strategically along the access lane. … as is a clean, inviting washroom. The Shell has been doing extremely well since opening and business has been brisk. 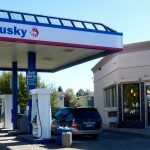 The accessway between stores has proven to be beneficial to the c-store store and the merchandising strategy has proven to be very effective. We knew what we wanted… but we knew we needed help. Mark knows his stuff. He provided invaluable guidance around choosing the right equipment, effective product placement and efficient customer flow. He also shared some great tips on how to work with suppliers. Mark’s advice has really paid off.